This week in school we were learning about squirrels. A squirrel is a rodent. There are 280 different types of squirrels in the world. 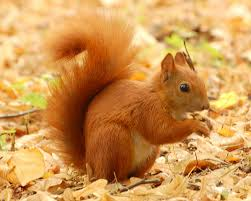 Most squirrels are red, brown and grey in colour. A squirrel had four legs, big eyes and a bushy tail. It has sharp toes to climb trees. A squirrel has padded feet and this helps the squirrel to jump very high. Some squirrels can jump 20feet! A squirrel has four front teeth that never stop growing. A squirrel builds a nest in a tree. This nest is called a drey. A baby squirrel is called a kitten, and when they are born they are blind. Squirrels eat nuts, fruits and seeds. During the winter they hibernate; this means that they go for a very long sleep during the winter months when the weather is cold. When squirrels are frightened they run back and forth in different directions to confuse the animals that are attacking them! stick to the book or the pencil because they are not made out of metal. 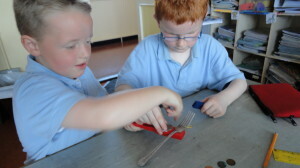 We had great fun using magnets. Fossil Fuels are coal, gas, oil and turf. We need fossil fuels to make electricity. But when fossil fuels are burnt they also create a gas that heats up the world, and all the extra heat might melt the polar ice caps where the penguins and polar bears live. Frogs lay their eggs in water. The eggs are stuck together in frogspawn. The eggs hatch into tadpoles. They have gills to breathe and tails to swim, like fish. Frogs have lungs to breathe and legs to hop. Frogs are amphibians. They live on land and in water. They live near swamps, ponds and in wet places like fields and bogs. Frogs have long sticky tongues to catch bugs. Frogs never close their eyes, even when they are asleep! We had fun at engineering day making roller coasters. We made a good one – we put the pipe onto the edge of the chair and when the marble went down the roller coaster, it rolled very fast and went into the cup! With Scott, we made a roller coaster. We had tape and a cup and the outside spongy part of a pipe. We put the tape onto the spongy part to make the roller coaster.